On Friday last, I arrived home to find one of those delivery cards together with the rest of my mail. Nothing unusual, you might think; except that this one was blank. I don’t mean a white card – that would be silly. I man, a branded missed-delivery card that should be filed in with the sort of information you might expect from such a document. But it wasn’t. Every white box remained virgin. As pure as the moment it left the printing press. So, knowing that it was a tracked parcel, I went on line to find out when I might expect a re-delivery. You can see from the screenshot what it says. The last entry is “Out with the recipient’s local courier to reattempt delivery 15:17 – Fri 09 Oct.” This suggests that there had already been one attempt and that this was a “reattempt.” I thought I would wait in for another delivery on Saturday but, judging by the efficient way the card had been filled in (not), I shouldn’t hold my breath. 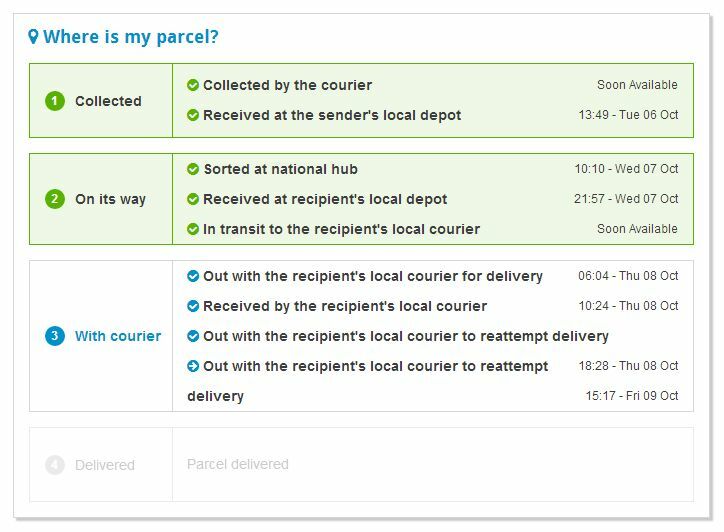 Now, the first thing I noticed about the MyHermes home screen is that there are no contact numbers. Delve a little deeper and you find no contact numbers. There is not even a “contact us” link to be found. Finally, I went to a page named “Find an answer” and type in “How do I contact Hermes?” At last, second answer down I find a link to a page that says “You can contact myHermes by email or webchat. Our team of advisors are available to answer your questions between the hours of 8am-8pm Monday to Friday and 8am-6pm on weekends,” with two option buttons. I’ll say nothing about the bad grammar. So, I began a web-chat after waiting in a queue behind four others for about ten minute. 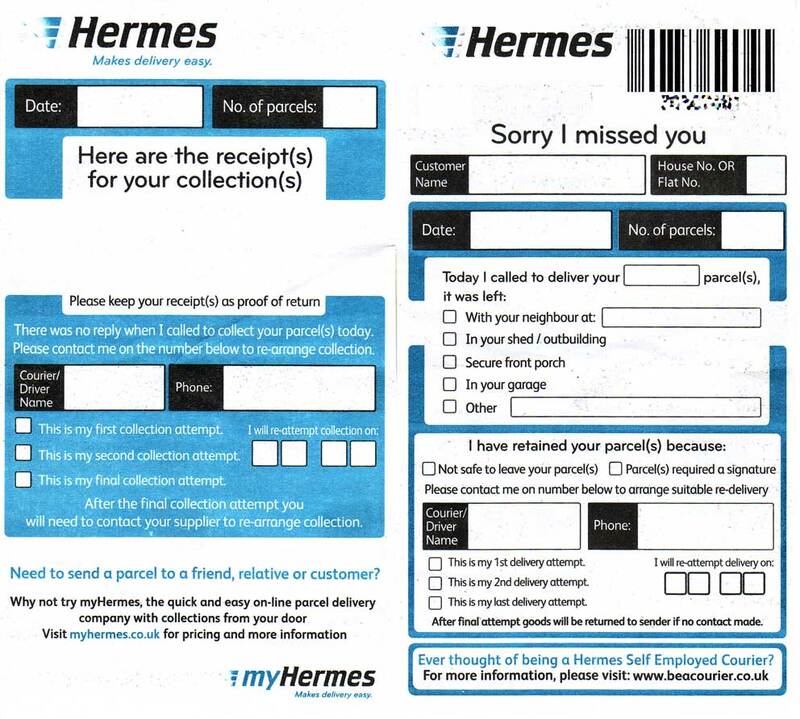 Now, I already thought that Hermes’ service wasn’t great. I wanted to scream after the web-chat. The full text of that web-chat is shown. I must point out that this whole web-chat took about twenty minutes because I had to wait an age for each reply, especially when she went to find a re-delivery time. I also need to highlight that the expected delivery days were 7th or 8th of October, the card was pushed through my letter box on 9th October and I’m having this chat on 10th so an expected re-delivery of 14th is a little unacceptable. Even Royal mail is more efficient than that. I’ve had so many bad experiences with Indian call centres (I was a H3G customer for six years!) that it really doesn’t surprise me any more when people start spouting borderline (or sometimes overt) racist comments. However, it isn’t Heena’s fault. She is just a cog on a remote wheel in a corporate machine that has been located a a place far distant from its customers. She is just a faceless voice representing yet another company whose policies seem to include having as little personal interaction with their customers as possible. Yes, it is my experience that Hermes is an inefficient and rude courier service and it would take a lot to convince me otherwise. 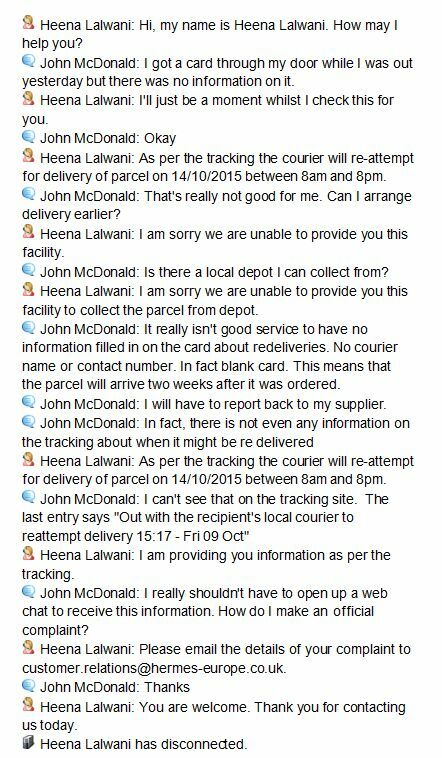 Over to you Hermes Customer Services.